The rear section of the JEALOUS is designed for the new Boost thru axle standard measuring 148 x 12 mm. Wheels with flatter-angled spokes can then be used to improve wheel rigidity. Boost cranks and Boost forks are also used on production models. The crank compensates for the altered chainline, and the 110 x 15 mm forks provide front-wheel rigidity for more control on trails. 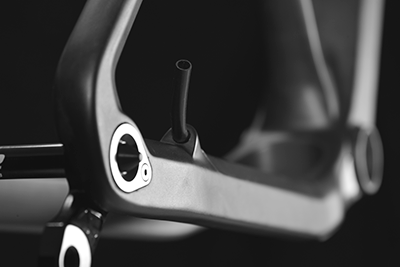 The Boost standard offers major advantages in respect of frame design. In addition to the already mentioned increased rigidity between the down tube and bottom bracket shell, Boost cranks allow for lower chain stays to give a shorter rear section and more space for tyres and chain rings. To achieve the ideal compromise between weight, look and maintainability, and prevent clatters, cables on the JEALOUS are routed both internally and externally. The rear derailleur cable is fully protected and concealed within the frame, exiting only at the very end of the chain stay. Brake hoses, in contrast, are routed along the surface of the down tube and chain stay. The same frame can be used for electronic shift component cables; only different sealing caps are required for entry and exit points. Flexibility also set the tenor for the seat tube design. To install a dropper post with handlebar remote control, the seat tube has a cable exit point above the bottom bracket. 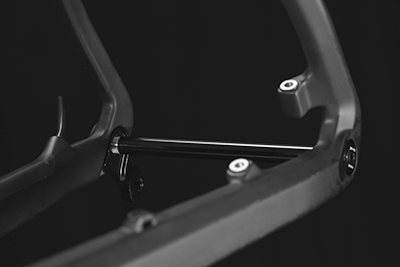 This enables a quick installation of a conventional seatpost for less technically demanding courses.